Emily’s startling description of airplane wreckage on the reef at Nikumaroro merits close examination. Although she had apparently never heard of Amelia Earhart and had little or no information about TIGHAR’s investigations, she nonetheless described a situation which not only fit our hypothesis (that the aircraft was landed on the reef flat off the western end of the island), but also provided details (a specific location and appearance) which seem to explain what has always been the most disturbing aspect of the puzzle – how could the airplane have escaped the notice of the various Westerners who later visited the island? If Emily’s recollection is accurate, it seems that the landing was made on the outer portion of the reef-flat just north of the shipwreck. Although this is one of the few areas where the reef is smooth enough to permit a safe landing, it is also perilously close to the breakers along the reef edge. Calm conditions could have permitted the sending of radio transmissions for as much as a few days, but the building of any significant swell on the ocean could have resulted in surf that quickly reduced the Electra to the sort of nondescript debris Emily describes. Visible only at low tide, rusty rather than silver-colored, not far from the shipwreck, and masked to view from the populated part of the island by the shipwreck itself, what little remained of the airplane might have been easily missed, or if seen, dismissed by anyone who did not have occasion to view it up close. The reef edge is a dangerous place and the only people with a reason to go there were the Gilbertese fishermen – so they were the only ones who knew. Later accounts of bits and pieces found along the shoreline, including some of TIGHAR’s own discoveries, could be chance encounters with a widely scattered debris field. It may be that Emily has given us the missing piece of the puzzle and our best clue yet as to where we should look for that elusive “smoking gun” artifact that will prove the case. It’s a tantalizingly tidy explanation, but it’s just a good story unless verified from sources that are not reliant upon the ever-fallible human memory. In evaluating any anecdotal account it is essential to verify as many details of the testimony as possible through contemporary written records. This process is not intended to disparage the sincerity of the witness but rather to get a general impression of the reliability of his or her memory of the events in question. If our interrogation of Emily’s credibility seems rigorous it is only because her testimony is potentially so important. To begin, we must ask the most basic question and establish that Emily is who she says she is. Emily says that her father Temou Samuela was the island carpenter on Nikumaroro. Photographs she showed us leave no doubt that Temou was her father, but was he the island carpenter? Dr. Duncan Macpherson’s first hand account of the death of Gerald Gallagher, dated November 9, 1941, specifically mentions that “… Temou (native carpenter at Gardner island) proceeded to prepare a casket for the remains.” It would seem that Emily is, indeed, the carpenter’s daughter. The next task is to determine whether Emily herself was on Nikumaroro and, if so, just when she was there. This allows us to put her alleged experiences in a specific historical context and check them against known events. We are able to confirm Emily’s presence on the island and establish the date of her departure by means of a rather obscure document which we examined in November 1998 at the archives of the Western Pacific High Commission in England. The provisioning records of His Majesty’s Fijian Ship (HMFS) Viti show a charge of two shillings per diem for the transport of a “nurse” by the name of “Sengalo” from Gardner Island on November 30, 1941 to Suva, Fiji (11 days). 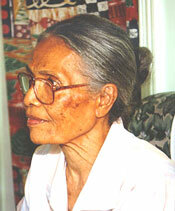 Emily’s first name in Tuvaluan is “Segalo,” pronounced (and often spelled) “Sengalo.” Is this Emily? RG: Tell me about when you left Nikumaroro, when you went away. How did that happen? RG: Was it your whole family or just you? ES: It was I only. So there was a test and you were selected because of this test? ES: Yes. That is why I came. Mr. Tofiga, I understand that you remember this. You were there at that time. Is that right? FT: I was aboard the Viti. We traveled from here (Suva) in the late November or early December of 1941. I never forget the date because we were at Nikumaroro when the Japanese bombed Pearl Harbor. TK: Were you there when Mr. Gallagher died? The ship’s records show that Viti was at Nikumaroro on Sunday, November 30, 1941, not Sunday, December 7th, so Tofiga’s memory of hearing about the Pearl Harbor attack while at Nikumaroro is apparently not accurate. However, Emily’s recollection that she left on a Sunday is correct. Clearly the nurse “Sengalo” is Segalo Samuela, now Emily Sikuli, and she left Nikumaroro on November 30, 1941. Pinning down just when the Samuela family arrived on Nikumaroro is a bit more difficult. Unfortunately, we don’t have passenger manifests for all of the ships that transported settlers and skilled artisans for the Phoenix Islands Settlement Scheme, but transportation of personnel and supplies was enough of a problem for the struggling colony that the comings and goings of ships are fairly well documented. Emily was unable to give us a firm date for her arrival at Nikumaroro, but there are clues in what she remembers, and does not remember, which make it possible to constrain the date of her arrival. TK: When did you get to Nikumaroro? ES: We had not been on Beru Island a year when we were sent to Nikumaroro. Perhaps 1938-39. In less than 3 years, I left Nikumaroro. Beru, in the southern Gilberts, served as a staging area for the settlement of the Phoenix Group. We don’t know when Temou and his family came to Beru but we do know that Emily left Nikumaroro in late 1941. Her “less than 3 years” on the island puts her arrival not earlier than late 1938 but, in fact, there were no women at all on Nikumaroro until April 1939. TK: What caused your family to move to Nikumaroro? ES: Instructions from the government to build houses and plant coconuts. Uncle Kemo went to Manra to build the hospital building and water tank. There are a couple of good clues here. The big push to build houses and plant coconuts on Nikumaroro was in the early days of the settlement – from the arrival of the first women and children in April 1939 through Gallagher’s death in September, 1941. “Uncle Kemo” is Jack Kima Petro (sometimes spelled Kemo Pedro). He was a half-Portugese construction specialist who acted as foreman for many of the building projects in the G&EIC and PISS. He was on Gardner in early 1939 building the 10,000 gallon water collection cistern which still stands today, and Emily seems to imply that he was on Beru when she left for Nikumaroro. Gallagher’s proposal for the hospital to be built on Sydney Island (Manra) is dated July 4th, 1939 and was drawn up on Beru. He left Beru on July 11th and went to Fiji for medical treatment and administrative duty, returning on November 7th. Gallagher left Beru to go back to the Phoenix Group on January 7,1940 and his “Progress Report, First Quarter 1940” states that the building of the hospital on Sydney was underway between January and March. Emily’s correlation of her arrival on Nikumaroro with the departure of “Uncle Kemo” to build the hospital on Manra seems to place the event in January 1940. ES: Three brothers, I was the only girl. RG: Did the whole family come to Nikumaroro? ES: Only three of us. Our eldest brother was at Tarawa. RG: Did your father ever work at building canoes? ES: Yes, he used to build canoes. RG: Was that part of his job on Nikumaroro? ES: Not while I was there. He did build small model canoes as presents. RG: Do you remember what ship brought the family to Nikumaroro? ES: It was the government ship, Kiakia. Not a big boat. There was, indeed, a small government ship named Kiakia which was used for administrative work. RG: Were there many people who came with you? ES: A policeman and his family came also. Gallagher doesn’t mention a policeman and family but they could have been destined for one of the other islands. RG: When you first came to Nikumaroro, were there any Europeans living there? This would seem to confirm that she arrived after the USS Bushnell’s survey of Gardner Island which was conducted from November 28 to December 5, 1939. Gallagher’s return to the Phoenix Group from Beru in January 1940 is the only known voyage which fits all of the conditions of Emily’s description. It is not clear from the record what ship was used, but it could well have been the Kiakia. In his “Progress Report, First Quarter 1940” Gallagher mentions that he stopped briefly at Gardner in January but doesn’t give the exact date. Other correspondence mentions that he arrived at Hull on January 14th and at Sydney, his final destination, on the 18th. Logically, that puts him at Gardner on or about the 12th. Unless better documentation turns up to the contrary, we will use mid-January 1940 for the supposed date of Emily’s arrival at Nikumaroro. which would make her 16 or 17 at the time of her arrival and 17 or 18 when she left to attend nursing school. Because most people can more reliably relate the year of their birth than how old they were at the time of a particular event in the past, and because the older age is perhaps more credible for a young woman to go away to school, it seems most likely that Emily was a youth of about 17 during the period in question. In either event, she was a youth or young adult, not a child. Having established fairly reliably that Emily lived, as a youth, on Nikumaroro from mid-January 1940 to November 30, 1941 with her father Temou, the island carpenter, and her mother and two of her three brothers, we can now review the context in which her experiences took place. When Emily and her family arrived on Nikumaroro in January 1940, the island’s population was made up of 16 men, 16 women, 11 boys and 15 girls, for a total of 58 individuals. Of the 16 men, one was the Native Magistrate, and one was a medic, known as a Native Dresser. The remaining fourteen were Gilbertese laborers who, with their wives and children, hoped to eventually become landowners in the new colony. Like pioneers everywhere, they were poor people who had come to the wilderness to find opportunity and a better life. They were Protestant Christians, as were Emily and her family, for the London Missionary Society had established a firm hold in both the Ellice Islands and the southern Gilberts. The laborers spoke the Gilbertese language and had little or no English. We didn’t ask but we must presume that Emily’s father, an Ellice Islander sent by the government to help people to whom he was a foreigner, spoke at least some Gilbertese. We don’t have the name of the Native Dresser. In the British colonial system there were two categories of medical certification for indigenous people. “Native Dressers” received training in basic health, hygiene, and first aid. “Native Medical Practitioners” received more extensive instruction and served virtually as physicians for island communities between rare visits by the colony’s Medical Officer who was a British doctor. The leader on Nikumaroro, whom Emily calls “the Onotoa man,” was the Native Magistrate and overseer Teng (Mr.) Koata. Formerly Native Magistrate on the island of Onotoa in the southern Gilberts, Koata had been recruited by Lands Commissioner Harry Maude to help establish the settlement on Nikumaroro with the understanding that it would be a temporary assignment. Koata, whose “exceptional qualities of loyalty and leadership had been proved in the Onotoa religious troubles of 1931” (Maude, Of Islands And Men) had been one of the senior Gilbertese delegates on the original voyage in October 1937 when Maude, assisted by Cadet Officer Eric Bevington, evaluated Gardner, Hull, and Sydney Islands for future settlement. Koata also helped Maude and Gallagher install the first ten-man work party on the island in late December 1938 and returned to take up residence on the island with his family in June 1939. He left Nikumaroro in 1940 on the RCS Nimanoa and traveled to the Central Hospital in Tarawa in the Gilberts where he arrived on or about September 30th. Whether he ever returned to the Phoenix Group is not known but a memorandum by Lands Commissioner Paul B. Laxton circa 1950 lists him as retiring and being replaced by “Teng Iokina” in 1941. The other player in the drama is Gerald B. Gallagher, Officer-in-Charge of the Phoenix Islands Settlement Scheme, whom Emily calls “Kela.” When the scheme was launched in early 1939, Gallagher, then 27 years old, made his headquarters on Sydney Island (Manra). He was able to keep track of events on Hull (Orona) and communicate with his superiors in the Gilberts and in Fiji by radio, but he was totally dependent upon rare visits by government ships for any inter-island travel. Because there was no radio on Nikumaroro until Gallagher moved his headquarters there in September 1940, his contact with the island prior to that time was sporadic at best. Emily’s two years on Nikumaroro, 1940 and 1941, span a crucial period in TIGHAR’s investigation. She is there in the spring of 1940 when the skull is found. She is there in September when Gallagher arrives, learns of the discovery, and searches out the partial skeleton and artifacts. She is there when the bones are shipped off to Fiji in a box built by her own father. She is there the following September when Gallagher dies. And she leaves the island a week before the outbreak of the war in the Pacific. In Emily’s mind, the bones for which her father built the box are inextricably linked to the airplane wreckage she says she saw on the northwestern reef, and yet we know from Gallagher’s telegrams that the bones he found were near the lagoon shore on a completely different part of the island (which he describes variously as “the South East corner” and “on the South Eastern shore”). The correspondence also gives no indication whatever that Gallagher was aware of an airplane wreck on Nikumaroro. Clearly there is a conflict between Gallagher’s and Emily’s respective descriptions of the discovery. Emily does not claim to be a witness to the finding of the bones and, in fact, says that she never saw them herself. Nevertheless, the documentary record leaves little doubt that bones were found. But what about the wreckage on the reef, which she says she saw on at least two occasions? Emily’s description of what she saw from the beach, which is roughly 600 feet from the edge of the reef, was consistent in both interviews. Where were the parts of the airplane? TK: Did people use parts of the airplane? ES: I don’t know for sure. When we got there only the steel frames were left, only the long pieces were there. We were frightened to go close to the plane. Where the shipwreck was – the remainder of the plane was not very far from there. The waves were washing it in low tide. And on the back of the map could you draw a picture of what you saw? It was a long steel. [draws a line] There was a round part of it. [adds a small solid circle at the end of the line] I do not know what part of the plane it was. We were forbidden to go there. I was following my father. When I went there my father stopped me. How big was this piece? So it might fit in this room? How did you know that this was part of an airplane? I heard it from those who were there before us that it was part of an airplane. So the people on the island said that this was part of an airplane. What color was the wreckage that you drew on the map? Very red. When it is seen at low tide. Not observable at high tide. At low tide it could be seen. Very rusty, bad, useless. Was there other wreckage or debris around it or all by itself? Did the people in the village have any pieces? You saw none of the other parts of the plane. The aluminum, the shiny parts? 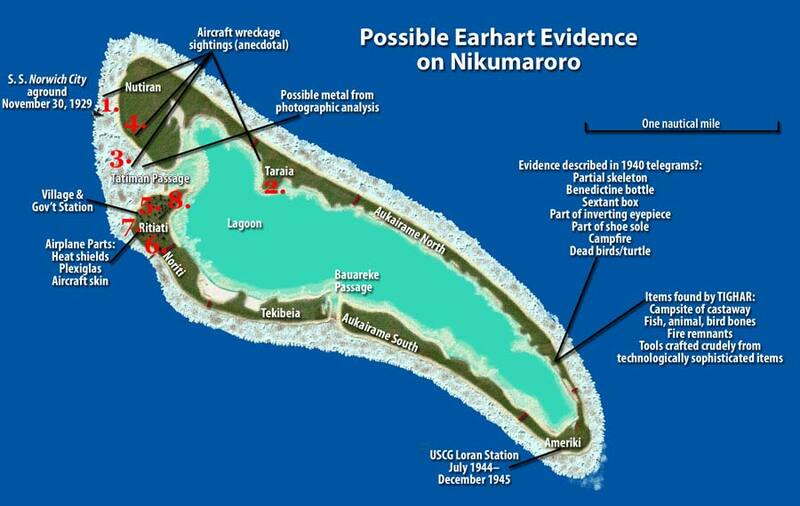 Fortunately we have a number of photographs taken between the date of the Earhart/Noonan disappearance and Emily’s departure from Nikumaroro which include the specific location she describes. If Emily could see the wreckage, we should be able to see it too. And we can, or at least we can see something that fits her general description of what she saw in the place where she says she saw it. Photo #1 (above) is a copy photo of a photograph taken by Eric Bevington in October 1937 during the first British evaluation of the island for future settlement. It shows the western shoreline of Nikumaroro and the northern side of the wreck of SS Norwich City which is, at that time, largely intact. The sea is quite calm and a line of low breakers delineates the outer edge of the reef. Just north of the shipwreck and just behind the line of breakers two objects, resembling a “dash” and a “dot,” are clearly visible. Photo #2 is a photocopy of a photograph taken in December 1938 by the New Zealand survey party which was on the island at that time. The camera is looking out through a hole in the north side of the SS Norwich City and shows the reef edge looking northward from the wreck. The photo is one of several dozen in a scrapbook of the expedition. 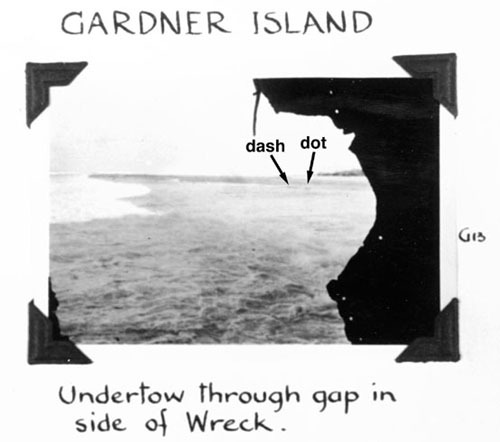 The caption reads “Undertow through gap in side of Wreck.” Even though all we have is a photocopy of this snapshot it is still possible to make out what appear to be the same “dash” and “dot” objects on the reef which appear in the 1937 photo. Neither of these photos have been altered or enhanced in any way, but even from these “raw” images it is apparent that there was something where Emily says there was airplane wreckage. The objects in the photos are not there now but forensic examination of better copies of these and other photos might provide more information about what they were and where they went. Of course, we can’t tell from the black and white photos what color the objects were, but we should be able to get some idea of how big they were by scaling them to Norwich City whose dimensions we have. Could the airplane pieces have been, in fact, merely debris from the shipwreck? That doesn’t seem very likely. At the time the photos were taken the ship had not yet started to break up and when it did, the debris field scattered predominantly southeastward toward the shore and the main lagoon passage. Gales and high seas hit Nikumaroro almost exclusively from the northwest. With photographic confirmation that there was something there, and in the absence of a good alternative explanation for what it might be, it makes sense to accept Emily’s second-hand identification of it as a working hypothesis. If further photographic research can establish that the material which is present in Bevington’s October 1937 photo (a contemporaneous, primary source document) is from an aircraft, the implications are obvious. Air traffic over the remote reaches of the Central Pacific prior to October 1937 was extremely rare and is very easy to catalog. Only one airplane from this period is missing. Did you see the plane fall? ES: No, it was already there when I came. …The steel of the plane was there sometime before we got there. [asked specifically about aluminium, she says no] Fishermen found the bones. They were frightened and they brought the story of them to the Onotoa man. TK: What did Koata do? ES: He sent people to bring the bones. People were frightened. Only people working for the government received the bones. My father had to look at the bones. Mr. Gallagher asked my father to make the box. What can you tell us about the bones that were found? ES: Some Gilbertese went to fish, they saw in the shallows some pools, at the place where the plane crashed, some bones, and they knew these were human bones because of the skull bone. They went and reported to Teng Koata, there were bones. So from that they assumed that these must have been the bones of those who were in the plane when it crashed. These were under the plane, near the plane. This was near the top end of the steel. RG: Did you see the bones? ES: I didn’t see them. We were forbidden, but my father told us. RG: Were the bones found while you were on the island or did this happen before? ES: These bones were found when we had already arrived on the island. These Gilbertese came and found bones and reported to Teng Koata. Then Teng Koata took them to the European. So it was arranged for a box to be made for the bones and the bones were brought. There were not many bones. RG: Were any other bones ever found on Niku? ES: Only these few bones they found. They do a search around that area but they found no other bones. Only these big bones that they found. I do not know how many. My father knew. Aside from where she says the bones were found, her account actually tracks fairly well with the known facts. A Gilbertese work party found a skull which Koata knew about. The European (Gallagher) did find out about the skull (although apparently not from Koata) and conducted a search. Not many bones were found (a total of 13) and most of these were relatively large. Gallagher had a box made for the bones. In short, it does seem that the bones Emily associates with the airplane wreck are the bones that were actually found elsewhere on the island. (near the shipwreck). She is quite clear that these bones were found on land. Mr. Tikana marked a map showing that bones were found on shore near the shipwreck, but to show where the “other bones” were found he could only circle the entire southeast portion of the island. We know that there were eleven men lost in Norwich City disaster in 1929 and that three bodies washed up and were buried by the survivors. If the burials were not very deep and were on or close to the beach, it seems possible that they may have been uncovered by storms in the ensuing ten years or so. It’s also possible that other bodies from the wreck washed up after the survivors were rescued. However, if a body from the airplane wreck (Noonan?) also washed up or was buried on that same beach it could be indistinguishable from the shipwreck bones. Emily Sikuli’s story, supported by historical documents and photographs, offers some long-sought answers to the riddle of the Earhart/Noonan disappearance. Whether or not they are the correct answers remains to be seen. They do, however permit us to adjust and refine the hypothesis we are attempting to test. But as answers to old questions are offered, new questions arise. Why does Emily associate the bones so strongly with the airplane wreck? And why did Koata put the area off limits? It is apparent that this was done before Gallagher arrived and found the other bones and the artifacts. Why did the finding of just a skull on a different part of the island cause Koata to put the airplane wreck off limits? And why didn’t Koata , or anybody else, tell Gallagher about the plane? But Tapania’s plane parts were not seen in the same place Emily describes. Over the years we have come across a number of anecdotal accounts of aircraft wreckage seen at Nikumaroro and we have ourselves, found a few pieces of aircraft debris which we suspect might be from the Electra. Are these real and rumored airplane parts random and contradictory? Or do they all fit together to form a logical sequence of events? – On two occasions between January 1940 and November 1941 Emily Sikuli sees rusted structures, said to be the wreckage of an airplane, on the reef near the ocean just north of the shipwreck (map reference 1). Emily does not see the wreck up close and no aluminum is visible from shore, but fisherman have been to the plane. Sometime in late 1944 or early 1945, U.S. Navy PBY pilot John Mims is shown an aircraft control cable being used as a heavy-duty fishing line leader by Gilbertese fishermen on Nikumaroro. When asked where it came from one of the islanders replies that when the Gilbertese people first came to the island there was an airplane here. When asked where the plane is now, he just shrugs. During roughly the same time period, his daughter Tapania sees a “piece of a wing” in the water on the reef off the shore of Nutiran not far from the main passage. Aerial photographs taken in 1953 indicate the presence of anomalous light-colored, reflective material on the reef in this same area. (map reference 3) Tapania also sees “airplane parts” in the shoreline vegetation (map reference 4) not far from a “European house” made of lumber rather than native materials. In 1989 TIGHAR finds an aluminum aircraft component near the shore of the main passage in the abandoned village. (map reference 5) The “dado,” an interior feature usually found in the cabins of small civilian aircraft including the Lockheed Model 10, is a complete assembly still bearing a fragment of the quarter-inch kapok insulation which once covered one side. Quarter-inch kapok insulation was standard on the Lockheed 10. Unlike military parts, the dado is stamped with no part number. In 1991 TIGHAR finds a section of aluminum aircraft skin on the island’s southwestern shore in the wash-up from a recent severe storm. (map reference 6) Although exhaustive research has not yet been able to match the rivet pattern to any aircraft, the general features of the skin (type of aluminum, thickness, rivet type, size and spacing) are typical of the Lockheed 10. The damage to the skin indicates that it was blown outward by a tremendous fluid force, such as wave action. These seem to suggest that the aircraft arrived at or near the place where Emily saw wreckage (map reference 1) and was quickly, perhaps within days, destroyed by the violent surf. In the ensuing years, storms further scattered the wreckage along the natural lines of force. Buoyant material would travel farthest and may account for Pulekai’s sighting of wreckage on the lagoon shore (map reference 2). Some non-buoyant wreckage might eventually be pulled back out over the reef edge but most of the aluminum should be scattered southeastward along the flat, as is indicated by Tapania’s piece of a wing and the 1953 photos (map reference 3). Storms could drive pieces of the wreck ashore anywhere to the leeward of its starting place where they might be found and used by the locals. It is important to remember that, by itself, Emily’s anecdotal recollections do not prove anything, but just as garbled anecdotal accounts of bones being found on Nikumaroro eventually led us to archival sources which documented a fascinating but forgotten chapter in the Earhart puzzle, so Emily’s tale has set us on a trail that may lead us to whatever is left of NR16020.